Morton’s Neuroma is a condition most frequently diagnosed among athletes. Identified by a thickening of the nerve tissues found in the ball of the foot, Morton’s neuroma most commonly affects the nerve that travels between the third and fourth toes. The thickened nerve tissue may be caused by irritation, trauma from injury, or constant pressure on the nerves of the toes. Morton’s neuroma has also been found to occur more in women than in men. This condition is commonly known to be caused by improperly fitting shoes or shoes with high heels or pointed toes. This type of footwear often compresses the nerves in the toe area, making these become numb. Wearing improper footwear during strenuous physical activities, such as running, adds stress to the toes, which may eventually cause foot complications to develop. 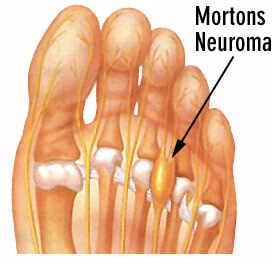 There are no visible signs for Morton’s neuroma, such as an outward lump. Common symptom of the condition include a burning sensation, pain, and tingling in the ball of the foot that travels into the toes. The pain usually may intensify when wearing shoes or when participating in physical activity. Although considered rare, the symptoms of Morton's neuroma may continue during night or with rest. If an individual experiences these symptoms, the first option to take should be getting the appropriate footwear. With the right type of shoe, any unnecessary pressure will be minimized. Lifestyle changes may also be recommended in order to avoid further injury to the foot. People affected with Morton’s neuroma should rest their feet as much as possible to avoid nerve irritation.